Hello! I am junior from Houston at Franciscan University, where I am in the Priestly Discernment Program. Since I have come to Franciscan, I have gone on three missions in Steubenville, Los Angeles, and Magadan, Russia. I will not be finishing my college career due to a very intense discernment that has urged me to enter this next Fall in seminary with the Priestly Fraternity of St. Peter. I humbly ask for prayers for someone as little as me to be faithful to the Lord's will and to trust in His ways! Thank you and may you always be in Corde Iesu, per Mariam. Hey! My name is Joseph Tweed. I am a junior Philosophy and Theology major at Franciscan University. I grew up in the mountains of North Carolina, and I am the youngest of 6 brothers and sisters. I am discerning a vocation to the priesthood with the Community of the Franciscans of the Renewal and I want to give my life to God in what ever capacity I am called. I enjoy serving God through singing and playing the guitar. 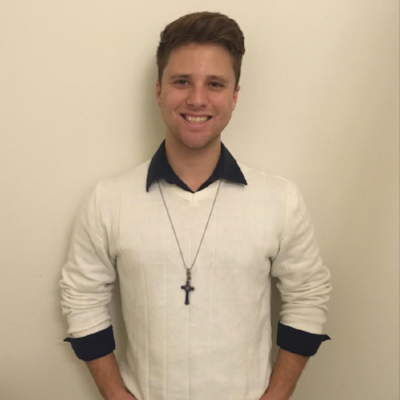 Cameron is a Sophomore at Franciscan University studying Theology and Catechetics with a Music Ministry minor. She served this previous summer as a Lifeteen Summer Missionary and was involved in Campus Ministry her senior year of high school. At school Cameron is involved in Dirty Vagabond Ministries, Prayer Teams, and Franciscan University's Musical Theatre Troupe. She is excited about studying abroad in Austria in the Spring and is very much looking forward to being a vessel of Jesus’ love, joy, and freedom to the people of Ireland. Hello! My name is Julia Jiminez and I am from California. I am a Multimedia Communication Arts student at Franciscan, who hopes to use her talents to glorify God. By God's grace I am striving for sainthood by bringing myself and others closer to Christ through love.